Learn how to quickly and easily import all your clients at once using our Studio Ninja CSV file. Importing all your existing clients is easy. All you need to do is copy / paste all your existing client information into our CSV file and import the file into Studio Ninja. On the Client Overview page click on the 'Import clients' button. A light box will appear asking you to download our CSV file template. 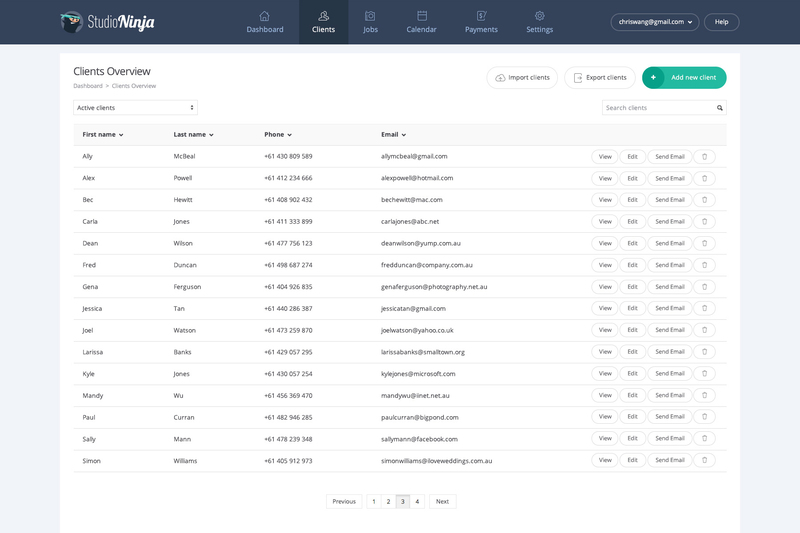 Once you have added all your client details to the CSV file, upload it back into Studio Ninja. Make sure you download our CSV template and resave it as the same filename once you’ve finished pasting in all your contacts. First name and email address are mandatory fields for adding new clients. If either of these fields are missing the CSV file will not upload. Please do not rename the titles in the top row or rearrange the columns of our CSV file. Make sure there are no duplicate email address entries. All email addresses must be unique. If there are any duplicate email addresses, the file will not upload. If an email address in your CSV file already exists in Studio Ninja, the CSV file will not upload. Make sure you check the file before uploading to make sure all your data is in the correct fields and that there are no duplicate clients that may already exist in the system! Your CSV file should import straight away and your Clients Overview page should now be populated with all your newly uploaded clients.